After many a leak, rumour, and speculation, Call of Duty: Black Ops 4 for PS4, Xbox One, and PC is finally here. Like past entries in the popular military shooter franchise, Call of Duty: Black Ops 4 has a multiplayer mode as well as Zombies, the cooperative gameplay mode. But unlike previous games, Call of Duty: Black Ops 4 doesn't have a single-player story campaign. In its place is Blackout, which is Call of Duty's attempt at a Fortnite and PUBG like battle royale mode. But is it any good? Read on to find out. With Call of Duty: Black Ops’ Blackout mode basics are the same as other games of the genre — you'll glide onto a sprawling map, jostle with upto 99 or 87 other people depending on whether you've chosen to play it as a squad or in pairs or solo, and you'll be on the run to find safe zones in an ever collapsing island while scavenging whatever guns you can find. Where Blackout differs from its peers is how thoughtful the entire experience is. Weapon placements make sense. You'll almost always find the right items where they should be. From armouries having high-powered tools of destruction to stores sporting backpacks, there's little amiss in the way you'll find most of the gear you'll need in Blackout. This smart placement of guns is great because you'll rarely be caught without a weapon, making each encounter seem fair versus other battle royale games wherein death due to not having a gun tends to be a regular occurrence. Furthermore, with Blackout mode in Call of Duty: Black Ops, there's a sense of diversity versus the competition thanks to the presence of zombies in the map. Yes, zombies. Certain locations will be littered with the undead and killing them grants you some great loot such as high-powered rocket launchers. They're a welcome addition to the proceedings and provide another way to get some of Blackout's better items. All of this is backed up by exceptionally polished moment to moment gameplay. Be it equipping weapons, ducking behind cover, or commandeering a helicopter, Blackout feels fast and fluid when compared to the likes of PUBG. Throw in an assortment of perks — one-time abilities that, for example, allow you to move quietly or stay underwater for longer — and you're never far from options on how to tackle Blackout's harsh terrain. And while Call of Duty: Black Ops 4 Blackout does a lot right, it seems to exist solely to address the problems existing in current battle royale giants like Fortnite and PUBG rather than bring its own interpretation to the genre. 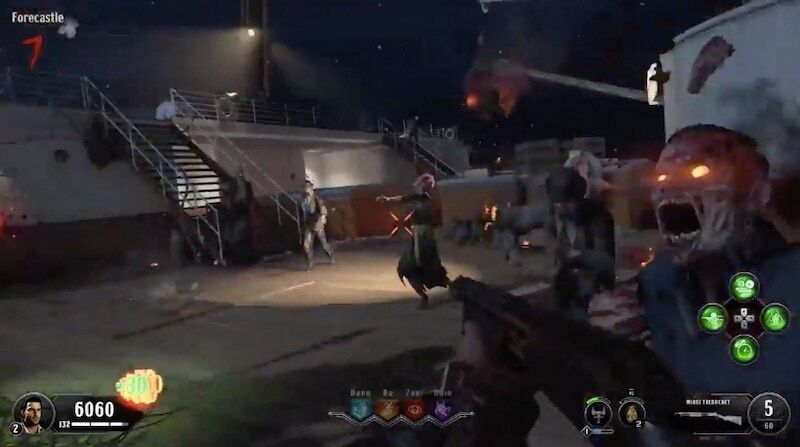 For example, it would’ve been interesting to see the Specialist abilities from traditional multiplayer or some of the wackier elements of its cooperative Zombies mode such as perks or over the top bosses find their way into Blackout. Right now however, there's none of that. It's possible that developer Treyarch will roll out such options post-launch much like how Fortnite has evolved to allow for Limited Time Modes. Moving onto Zombies, it's as weird and wacky as it's been in previous editions of Call of Duty. You'll control an adventurer with its own unique skills and abilities and are paired up with three others as you deal with hordes of the undead in a host of intriguing locales. From a Roman Coliseum to a stunning facsimile of the Titanic, each map in Zombies is a varied affair. There's an attempt to tell a cohesive story across them but you'll be too busy dealing with all sorts of zombified creatures including tigers, gladiators, and a hulking monster known as the Blightfather. Like past Call of Duty entries, it's a fun romp that's best enjoyed with friends. Compared to Blackout and the traditional multiplayer mode, the gunplay in Zombies feels a bit rough with recoil and spread not being as precise as it is in other modes. While this is done on purpose across the game and with good reason, it doesn't make the experience feel as consistent as it should. And speaking of the traditional multiplayer mode, you'll choose from one of 10 Specialists — characters you play as in Call of Duty: Black Ops 4's multiplayer —much like heroes in Overwatch albeit with far less flair and personality. These include support Specialists like Clash that can heal your entire party and the flamethrower-toting Firebreak that can clear a room with ease. Much like the Call of Duty: Black Ops 4 multiplayer beta, we ended up making use of their abilities in tandem to set up wins. Be it playing as Prophet and using seeker mines (which is essentially a drone with a taser) to incapacitating foes with the likes of Battery who uses a grenade launcher to set up a fatal blast radius, you'll discover plenty of ways to play and win. The maps such as Hacienda, Jungle, and Seaside seemed well thought out, ensuring that no side starts at with an advantage or disadvantage, while others like Payload stuck out like a sore thumb with how easy it is for the attacking team to get a foothold in match types like Control where teams take turns attacking and defending areas on a map. Movement in Call of Duty: Black Ops 4's multiplayer feels as compared to the beta. It's not as arcade-like as Call of Duty: Black Ops 3, but it feels a bit faster compared to what was experienced there thanks to gun recoil being low and fire rates seeming just a bit faster. Nonetheless, you still have a fighting chance if you're caught unaware by an enemy and firing from the hip still works even from a distance. It retains its tactical feel with movement that's a step down from past Call of Duty titles. Running on a wall and hovering in the air are absent, though sliding across the floor and around corner is possible, making you depend on Specialist abilities to get out of a sticky situation. While Call of Duty: Black Ops 4's multiplayer, Blackout, and Zombies modes are varied affairs, there's little in the way of cohesion between them barring basic traversal elements. They could essentially stand as three different games. Granted that was the case with past Call of Duty titles as well, but the presence of a single-player campaign made the overall package feel more robust and uniform, with a similar theme permeating through the proceedings. With Call of Duty: Black Ops 4, the cracks between them are harder to miss, making it seem like three games in one instead of one game with three distinct modes with a few basic commonalities. Each mode having its own progression system, unlocks, and rewards rather a common pool further drives this point home. Thanks to this, there's little incentive for most to try out a mode they're not fans of or comfortable with as the gear and perks you've unlocked in, say, Zombies won't work in Blackout and vice versa. Furthermore, there are other concerns. Net code didn't exactly seem primed and ready. Despite launching early in several regions we were treated to several connection errors that plagued the experience across all modes and we found ourselves disconnected mid-game on occasion too. You can play Zombies offline or play multiplayer with bots but that's it. Sure, day one hiccups for hotly anticipated online games are the norm but this also makes the lack of a single-player campaign all the more glaring. There's a somewhat half-hearted attempt at this with a feature called Specialist HQ that teaches you how to play as each Specialists, but it basically amounts to training with bots and little else. It's punctuated with cinematics that delve into some bits of their backstory, but it's sparse at best. Tragic when you consider the attention to detail given to each Specialist in terms of their character design, ensuring there's a story waiting to be told. And it doesn't help matters that Call of Duty: Black Ops 4 has a ridiculously steep price in markets like India — where the game used to sell at a premium over other titles anyway — and a colossal day one patch of 50GB for those who plan to buy it on disc. Make no mistake, Call of Duty: Black Ops 4 is a polished effort. If you can stomach its ridiculous day one patch, lack of single-player, and its high price, you'll be treated to one of the better multiplayer experiences in recent memory. For many though, the entry barrier may just be too high to bother. Gadgets 360 played a review copy of Call of Duty: Black Ops 4 on an Xbox One X. The game is out now for PS4 and Xbox One at Rs. 4,699 in India ($60 in the US). Call of Duty: Black Ops 4 is on PC as well for Rs. 4,432 ($60 in the US).